I've been using Mapopolis with my Treo 650 as my in-car GPS solution for two years, so when Transplant GPS asked me to review their new EMTAC Navigator PalmOS Bundle, I jumped at the chance. 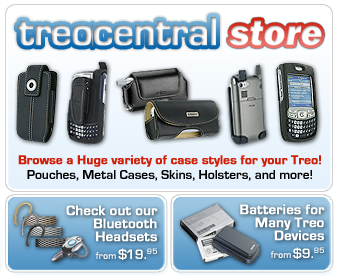 As many of you know, there are only a handful of choices for GPS Navigation for PalmOS Treos. TomTom (Palms GPS Navigator) is probably the most well known, followed by Mapopolis. There's also TeleNav which pulls down map data over-the-air as you drive but requires a monthly fee. All these solutions use the same NAVTEQ mapping data but each has a different method of displaying it and varying levels of ease of use or lack of it. When Transplant's bundle arrived and I tore into it, I found a DVD case shrink wrapped to the Bluetooth GPS receiver's box. The DVD case held a CD with the quick-start guide and EMTAC Navigator DVD with the mapping files and the main application. The whole ball'o'wax has a registration serial number affixed to the front of the quick-start guide. The tiny, black Bluetooth GPS receiver comes in a flashy retail box which also contains a velcro-closure leather case, and a car charger that juices up both the GPS and the Treo. I was disappointed that an AC (wall) charger was not included too. Both AC and DC adapters should be included in the box of any hardware item at this price point. Think about this. Not everyone owns a car. There are plenty of people who live and work in, say, NYC, who don't own cars at all. And suppose you want to use GPS on your Treo on a biking trip? Where are you supposed to get a 12v power source to charge up the GPS receiver? Of note, you CAN buy the AC adapter as an optional accessory but why couldn't they just toss it in? I've reviewed many Treo accessories designed for in-car use that come with both chargers so this looked suspiciously like cost cutting to me; AC wall warts are hardly expensive accessories. I just wanted to charge up the GPS receiver while I installed the software and read the manuals, but I had to take the tiny black unit out to my car and charge it there. C'mon, Transplant, just throw in an AC charger to and be done with it. Following the directions in quick-start guide, I plopped the DVD into my laptop. It spun up and its fancy Installer appeared. The installer uses a pretty basic webpage (no internet connection required) with which you select your installation method (HotSync or Storage card reader); then click to install the application, navigation voice prompting audio files, and map data. Since I had a spare SanDisk Ultra II Plus USB card handy, I choose to install directly to the card, which folds in half and plugs right into any available USB 2.0 port. See my earlier review of this innovative card which eliminates the need for you to have to schlep around a card reader at all. EMTAC's software installation was pretty easy and painless and I liked the way it let me install state-by-state instead of having to go by county or region. I installed the maps for all of California and Nevada on my card; both states ate up a total of 120mb. On a side note, I think they should have California separated by north and south. But with the whole country on one capacious DVD it eliminates the need for switching CDs to load different states/regions. I wanted to take a peek at how the EMTAC Navigator handles its files on the storage card. The installer puts the main application into the "Launcher" folder (makes sense), the voice files go into the "AUDIO" folder, and the map files go into a "Digi-Map" folder it creates. Unfortunately, the map files' names make no sense whatsoever. They are a bunch of meaningless (to humans) alphanumerics, like "K315.DGM" which tells me absolutely nothing about what piece of geography that is, unlike Mapopolis who names their map files by state and county. This pretty much forces you to use EMTAC's install routine rather than just scanning down a list of logically named map file names and drag and drop the ones you want for where you plan to travel onto the card, since looking at a directory of the DVD, you have NO clue which file is what state and no list is provided to translate those computeresque filenames into simple English. With a big enough SD card you could just install the whole USA and be done with it, but if you live in Oregon and never plan to drive around in Tennessee, why eat up card space that you could use for something else? Well, as SD card capacity grows, the prices keep shrinking so pretty soon it won't matter anyway. With the application, voice files, and maps on the Treos storage card its finally time for the games to begin. Sliding the card into the Treo starts the EMTAC Navigator program and greets you with, EMTAC Navigator is not registered, do you want to register now? Uhh.. yeah, I do. Tap the green check mark and it tells you to go to the registration website with a computer. I went to the website and entered my serial number (from the front of the quick start guide) and my device ID. Luckily the device ID is tied to the storage card, not the phone (which is nice if you have a couple of different Treos like I do). Registration is fairly easy and is outlined in the guide and you only have to do it once. After entering the license code and I saw EMTAC Navigator is now registered! I tapped the green check mark to agree to the EULA (End User License Agreement) and was staring at the GPS wizard. Phew! Are we there yet? Not quite. Although the GPS receiver came out of the box as many products do - with a partial battery charge, the quick start guide instructs you to charge the unit before using, as almost every product with a built-in battery does. This is where an AC or USB charger would have been useful. Since it has a charge and Id rather not go out to my car, I tempted fate and opted out of fully charging the unit first. With the Treo's Bluetooth turned on, tap on Bluetooth GPS, the Treo does a Bluetooth search and up pops BTGPS. The Treo and the Bluetooth GPS receiver quickly saw each other and connected. Then I was greeted with the "Select Destination" screen. While reading this next section, don't be too put off by all the steps I'll describe. GPS software is usually complex and routing to a destination involves a lot of steps. It'll be a fine day when you can just shout at your GPS software "plot me a route to the nearest supermarket" and it knows what to do. Well that's still Futurama, and with any complex software, the more you use it, the easier (hopefully) it gets. But I'll give you the blow-by-blow I went through the first time I used EMTAC Navigator. Fasten you seat belts. As you can see in the screenshot, the Select destination screen has nine options, thankfully on big, fingerable buttons, and all the screens in this software are colorful and attractive. This was a pleasant change from Mapopolis' mostly monochrome interface. Tap Country: All and you get the option of searching through all of the states you have loaded (Country:All), states East of the Mississippi (USA (East)), or states West of the Mississippi (USA (West)). I suppose this helps if you have a lot of states loaded, but for my initial run through I just loaded California and Nevada so I left it on Country:All. The EMTAC Navigator software lets you enter an address by starting with either the name of a city or a zip code. Tap on "Address" and you get a list of states. It's natural to tap on the state you wish to search, however that is not the case with this software. It prompts you to start typing the city or Zip code you want to route to. I know city names, not Zip codes. How about you? After tapping on the name of the city, then the green check mark, you are prompted to enter the name of the street. I typed the first three letters, "P-A-C", and Pacific Coast Hwy appeared on the screen, along with Pacific Lane and S Pacific Coast Hwy. I tapped on Pacific Coast Hwy, then the green check mark  the equivalent of "do it", as opposed to the software's red "x" which means "cancel" or "don't do it." This took me to a map of the desired road, and prompted me to enter the store's street number (5035). Normally, one wouldn't know or even care about a familiar store's street number, one just know where it is, but I happened to have Ralph's address on a receipt in my pocket from an earlier shopping trip. Once you enter the street or "house" number and tap on yet another green check mark to continue, you get the option to edit your speed preferences (to avoid highways) and to have the route automatically re-calc if you miss a turn while driving. Again, this was a short, local trip to a store I've been to a bajillion times, but I followed along with the steps the software wanted me to take. Leaving the preferences as they were (only automatic route re-calc checked), I tapped the green check mark and started the journey to Ralphs. By now, the green LED on the Bluetooth GPS was flashing, indicating it has a GPS position fix. Since the EMTAC receiver uses the latest SiRF Star III chipset, it gets a satellite lock in less time than it took you to read this sentence. The software quickly routed me to Ralphs and I heard a voice prompt spoken by a very clear British woman's dulcet tones: In three hundred yards turn right. All voice prompts are given with time to spare and whenever I took a wrong turn on purpose, the software quickly recalculated my route and re-routed me back to Ralphs. Unfortunately, unlike Mapopolis, which has text-to-speech synthesis and can robotically speak ANY street name on the maps, EMTAC uses a digitized voice which, while much clearer and human-sounding, can only say about two dozen different things, and it does NOT speak street names as you drive. Instead, she'll tell you to "turn right in x yards" or "make a u-turn in x yards." There's no SD card in existence that could hold digitized voice files of every street name in the country, so what you gain in clarity, you lose in detail. I prefer Mapopolis' robotic text-to-speech. Would you recommend EMTAC Navigator 3.0 Palm OS Bundle?